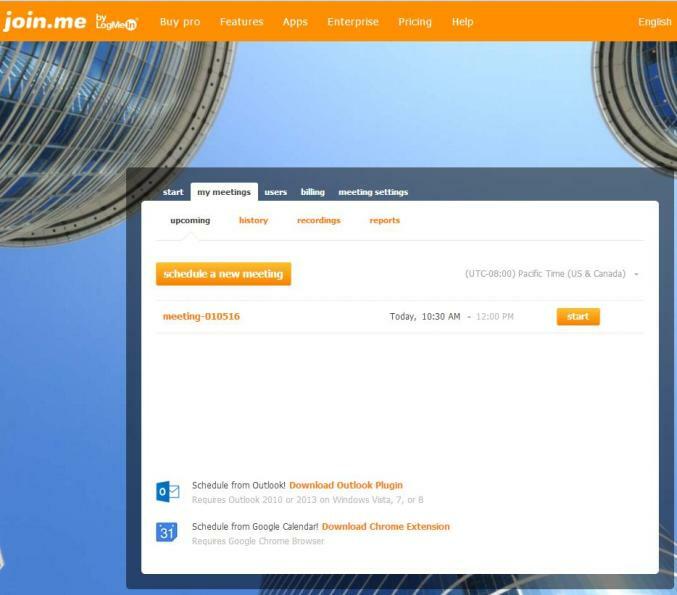 join.me is an easy to use web conferencing service that is used for online meetings and includes audio and video conferencing capabilities. Use the tabs below to navigate between user reviews and user Q&A sections. One of the newest videoconferencing platforms to hit the market is join.me. Developed by the makers of LogMeIn, this program first became available in beta form this past summer. In July, the addition of video feed capabilities moved it into full scale mode. The inclusion of 5 video feeds for free is better than all other competitors with the exception of Adobe Connect. join.me is easy to scale up or down as your needs change. The ability to customize the background (with your own image or with one from join.me) is fun but our favorite personalization was the option for a custom URL. Presenter controls are very robust. Presenters can share audio and screen, identify who is on a webcam, mute or allow users to talk and more. Meeting controls let you set whether a session begins once the organizer logs in or after two or more people join, and whether or not hold music and a beep upon entering and leaving is heard. The online chat feature is quick, nimble and responsive. Scheduling is easy with integration to Outlook and, for Chrome users, Google calendar. Remote control from an iPhone is a pretty slick feature. Video feeds appear as individual bubbles on your screen. The ability to move each one individually is a plus so you have more control over your viewing area. Lock feature lets you prevent unwarranted access to a meeting, requiring that new attendees “knock” when requesting admission. Some people may bemoan the lack of a password being required here but we prefer the knocking so there is no hassle with forgetting and needing to reset passwords (who doesn’t hate that?). The no-frills layout keeps things easy to use with a top bar and drop downs so most of your screen can be left available for meeting purposes. All in all, there’s a lot to love about join.me and it certainly can give other competing programs a run for their money. The lack of toll-free numbers seems may be an issue for some customers. True, many people have phone plans with unlimited long distance included but still, VoIP technology makes offering a toll-free number pretty darned simple. That being said, per minute toll free charges are expensive so including this in the pro or enterprise package was likely not feasible. It would however be nice to have an option to include a toll free number for an additional fee. The whiteboard feature is so great and could be such a useful tool - but it is a pity that it is currently limited to the iPad. Among the “benefits” that join.me promotes is the lack of any software to install. However, one of the first things you are prompted to do is to download the desktop app. Isn't an app considered to be software? The need to install a plug-in to initially set up a meeting space was a disappointment in what was otherwise a relatively simple setup process. That being said, I have tested many web conferencing services and so far they all need to install a plug-in to use the service. join.me does not automatically disconnect sessions after callers have hung up for certain periods of inactivity. This can pose a serious security risk and should be at the top of their “fix” list. The text size is so incredibly small and the only way to adjust it is to reconfigure your desktop’s resolution, thereby reducing the quality of other applications. This is a real negative for sure. Video only works on Chrome browser for the desktop. When users multitask (and they do) and then return to the join.me interface, they are registered as new attendees versus being recognized as returning or “still there” guests. This can add up the tally of your meeting attendee list rather quickly and needs to be addressed. Note that Windows Vista support will be discontinued in early 2016. It is worth noting that you will lose Internet calling functionality if you decide to use an actual phone number for your conference calls audio. Recording of voice conversations will also no longer be available. Clearly there are issues with what is still a relatively new platform. The new factor will give join.me some time to fix true problems and continue to enhance its service but the operative word there is “some”. Wait too long and they could find themselves in trouble as there are lots of other web conferencing solutions to choose from. Free plan is an excellent option for a web conference with up to 10 attendees using Internet calling for audio. Pro plan is $20 per user per month and expands the service to enable up to 50 attendees. It also increases the number of video conferencing feeds from 5 to 10 in addition to making mulitple other tools available such as recording and reporting. Enterprise plan is $25 per user per month and adds more management tools to the pro version of the service along with a Salesforce integration feature. This plan also scales the possible number of meeting attendees to 250 participants. Attendees may be subject to local or long distance calling fees if they choose not to use the Internet calling feature. Overall, companies in the SMB space would do well to consider join.me in their repertoire of videoconferencing software. That said, I think that waiting until a few enhancements have been completed may be the wise way to go. Once that happens, this could be the system to use. Here is a screenshot taken prior to starting a web conference. Overall the menus are fairly intuitive. join.me reviews are listed in chronological order. Over the years I have used Microsoft live meeting (no longer in existence), webex, gotomeeting and a few other web conferencing services. To say the least there are definitely pro's and con's with every solution and I always seemed to run into two major problems. First is that Internet Calling was choppy, had echo or was simply impossible to use because of low overall voice quality. The second was that I would see huge CPU spikes when I using these tools or screen sharing resulting in slow responsiveness for both the webinar and my other PC applications I had open. To get to my point, I have been pleasantly surprised with join.me and even the free service has not shown any of these issues so far.